It started at Interlochen while rehearsing Shostakovich #8. A pain in my left first finger, down at the knuckle. I thought that maybe I had over extended or otherwise strained my first finger playing that low C# for so many measures. My remedial action was to play the note an octave higher and then ice that joint and give it a rest. Several weeks later, that joint still pained me and started affecting simple things like picking up an empty sauce pan. It was time to go see a doctor. It turns out that it wasn't an injury that would get better with time and rest. That pain I had been experiencing was arthritis. It was a diagnosis that surprised me. I had thought that something like that would come along slowly. But no, arthritis can come on very suddenly with a flip of the switch at any age. My doctor luckily is also a musician (flautist), and appreciated my dilemma. She prescribed me a compounded cream that she swore would do the trick, knowing that quitting viola was tantamount to a death sentence and something I could use long-term without alot of risk. She called it "better music through chemistry". It arrived today, along with my birthday present from my mother. 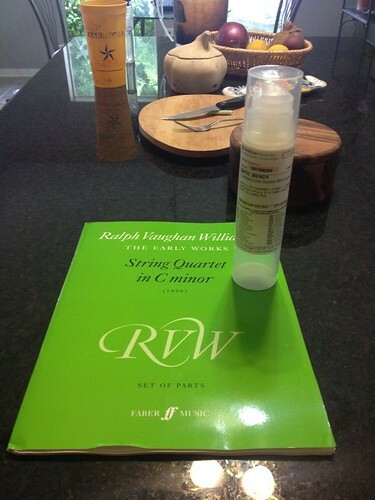 After reading through the instructions, I applied this cream to my knuckle and viola! My aches and pains subsided enough for me to practice like I did before. The only downside I see so far is that now I'm playing a few notes a bit sharp (rather than flat). I think I can live with that. The next thing on my agenda is getting a new pair of glasses. Oh the joys of aging. Aw Mendy, sorry for the arthritis woes but glad to hear about the cream. I can think of a few folks folks in my circles who might be all over that. Sympathizing, Mendy. I'm having a fair amount of pain at times in the base of my left thumb, so I too worry about how this may impact things. We may all want the recipe to your cream! And Hi Christina C. :) I'm thinking I may be seeing you in the upcoming Nov. 9 concert? Man, I wish some of my age-related issues could be cured with application of a bit of cream! Today is my 63rd b'day, and I am just glad I am still doing ok for the most part. Those are the moments when we (begin to) realize just what a gift it is to be able to play--well, poorly, it doesn't matter--to PLAY our instruments. I'm with you, lady. No creme for me, but I struggle on. You, too! Good job. I know what you mean about the "suddenly" part. A couple of months ago I noticed that the my right pinky was bent to the left at the last joint. My doctor tells me it's arthritis. Fortunately the stiffness and pain, if any, is quite minor - and since it's my bowing hand I haven't noticed any effect on my playing. As long as we can find a way to keep playing, though, we can't complain too much. I draw my inspiration from one of the violinists in our orchestra who recently passed away at 92 - and was playing from his wheelchair right to the end. We might get old and decrepit, but the music remains fresh and alive forever. As long as we can still play it, we are drawing on a fountain of youth. Mendy, so sorry to hear of your arthritis. I know of what you speak. Sometimes the base joint of my right thumb hurts so bad it is hard to hold the bow. But I keep going and I guess when I can't hold a bow it will be on to the mandolin. Glad you were able to find relief and good luck. Karen asked me & I wish I could but I'm already going to a chamber music weekend in Vermont, besides it sounds like the pay (if any!?) wouldn't come close to covering the trip. Really too bad 'cause I love LvB 7th (especially 2nd violin) & what a tremendous opportunity to play under Batiz! You'll be seeing Karen, though. Enjoy! and now back to our regularly scheduled programming: Mendy- could you provide some details about the cream, I really do think some of my friends would be interested. it is a compounded cream (prescription)that has flurbiprofen, baclofen, lidocaine and pentoxifylline in it. In other words, stuff for pain, inflammation, blood flow, and a muscle relaxer.